I got back to Vancouver yesterday afternoon and even managed to fit in a quick visit to the library once I had dropped my bags at home. Priorities people! (It also helps that the library is on the way to the grocery store, where, having returned home to an empty fridge, I really did have to go.) That said, I only picked up one book there; the rest of these are all e-books I downloaded over the last week while I was still out of town. Lunch with Jan Wong – a collection of celebrity interviews Wong, a Canadian journalist, wrote for the Globe and Mail during the late 1990s. 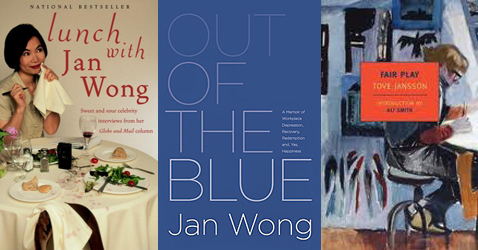 Out of the Blue by Jan Wong – after reading Lunch with Jan Wong and remembering how much I enjoy her writing, I grabbed this from the library after I got home yesterday afternoon. It is a memoir of her struggle with workplace-caused depression and the only one of her books I haven’t yet read. Fair Play by Tove Jansson – NYRB, who reissued this, describe it as “the type of love story that is rarely told, a revelatory depiction of contentment, hard-won and exhilarating.” I have been meaning to read more by Jansson ever since I read her wonderful The Summer Book. 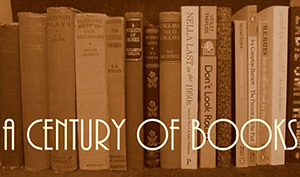 Notes From a Big Country by Bill Bryson – a collection of articles Bryson wrote for a British newspaper when, after twenty years of living in England, he and his family moved to the US. I have read this a few times and it is always funny but still probably my least favourite of Bryson’s books. 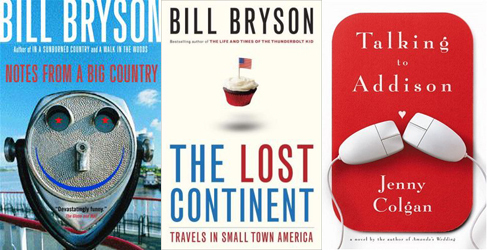 The Lost Continent by Bill Bryson – Bryson’s road trip through small-town America. Talking to Addison by Jenny Colgan – some tried and tested chick lit. This isn’t Colgan’s best (check out Amanda’s Wedding) but I am very, very attached to some of the minor characters in this book. I love Fair Play, but it does tend to be the Jansson people stumble on – so, if you love that, you’ll love ’em all! I adore Bill Bryson. I recently read “The Lost Continent” and laughed all the way across America with him. He is such an engaging writer. One minute he will be seriously giving you some interesting historical information and then hit you with his outrageous take on what he has just told you. A treasure. I haven’t read any of Bryson’s books yet. I’ve checked one out but never got around to it. I always enjoy Bill Bryson too. Enjoy your loot and the return to a real library. Bill Bryson is such a hoot! I started Notes from a Small Island a few weeks ago but haven’t been able to pick it back up yet. Soon! on March 21, 2013 at 04:41 | Reply Karen K.
I started an audiobook in the car, Unaccustomed Earth by Jhumpa Lahiri, and I also checked out this hilarious-sounding book called The Clumsiest People in Europe. It’s a reprint of a Victorian travel guide written by a cranky woman who apparently never went anywhere, just sat at home spouting off about foreigners. I haven’t started it yet but I think it’ll count for a nonfiction classic for the Back to the Classics challenge. I love Bryson! I’ve read both of those and of the two I enjoyed Lost Continent the most. I rather like the sound of the Jan Wong books … not heard of this journalist, but then, I don’t expect to living in the UK and Jan Wong working in Canada. My reading has been curtailed this week as I’ve been weeding my bookshelves and will be contacting a local charity today to bring a van … yes a van will be needed to collect them, there are so many. Last time I had a mammoth weed was in 2006 when I held a coffee morning and books sale (and friends brought their unwanted books along, too) and we raised £350 for charity in two hours, selling the books at around 50p or £1 each (paperback/hardback.) I do not like weeding my books but there comes a time when the overflow onto the floors and every other flat surface is overwhelming. Space is finite. I have to ensure that the books on the shelves really merit being there! My priorities would be pretty similar to yours! Bill Bryson is a favourite of mine and his chapter on the correlation between homelessness and the US phone system reduced me to hysterical laughter when I read it -reminders of my time as a tourist to the US in the 90s. Enjoy your reads.